Y’all need to know something about me (if you don’t already). I LOVE Christmas! As much as I hate winter, that’s how much I love Christmas. I love spending time with my friends and family, playing games, eating delicious food, celebrating our faith, and of course, giving gifts. I don’t mind getting gifts, but what I really love is giving gifts. Seeing people’s reactions when they unwrap their presents is priceless. I love making them feel happy and special with what I am able to give them. So, I do my best to give gifts that make the receiver feel special and loved. I try to make them as personal as possible so that they know I was thinking specifically of them when I bought or made the gift. As much as I love Christmas and giving gifts, it can get expensive really quickly if you aren’t careful. Although I didn’t set a specific budget for gifts this year, I’m trying to keep it under control as much as possible. One way that to limit your spending on gifts is to embrace a minimalist Christmas. What is a Minimalist Christmas? A minimalist Christmas is something my whole family decided to try for the first time a couple of years ago. In past years, my immediate family – my dad, my mom, my brother, and I – would meet at my parents’ house for breakfast and then would begin opening gifts from under the Christmas tree. We always take turns going one at a time so we can “ooh” and “aah” over each person’s gift before the next person’s turn. While this did drag out our gift exchange, making it quite a bit longer than it would have to be, it also served as entertainment for us too. But in recent years, I noticed that we were getting so many gifts at Christmas that we weren’t really using them, appreciating them, or even remembering all of them. With that in mind, I asked my family if they’d be okay with having a different kind of Christmas. Instead of going crazy buying so many gifts for each other, we are going to try to have a minimalist Christmas. We only give one gift per person. For our small family, a minimalist Christmas means that each of the four of us receives three gifts in total – one from each of the other family members. This made us more appreciative of the gifts we received. Plus, it also made us better gift-givers too. 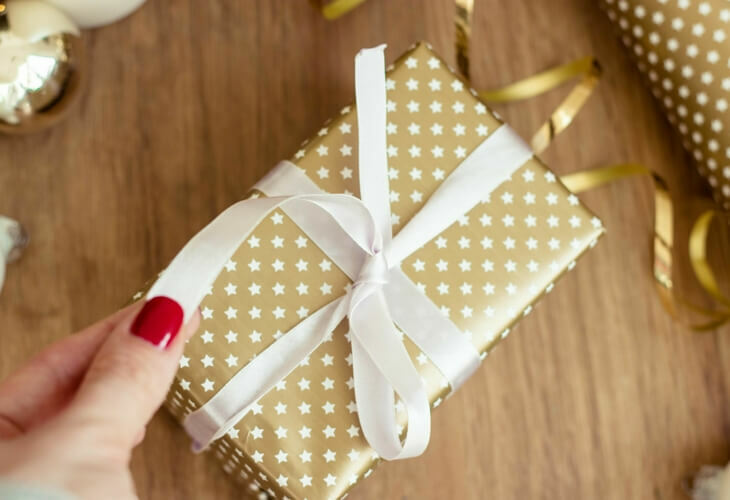 We started to put more thought into what we bought or made for each other, because we wanted our gifts to really have meaning or be extremely useful for the receiver. Cutting down on clutter gifts. Using less wrapping paper, which saves more money and reduces waste. Saving time shopping, wrapping, and unwrapping gifts. Plus, now that my brother and I are both adults, we don’t necessarily need our parents to gift us everything we need during Christmas and birthdays. We can buy most of the things we want and need on our own now. My family didn’t set a spending limit on the gifts. Instead we decided to stick to a “reasonable” price range. Our new minimalist Christmas tradition has really changed the holiday for us. Now we have more time to enjoy each other’s company after unwrapping gifts. It was a great change from our typical Christmas which used to be overrun with too many gifts. Does your family have gift or spending limits? Do you have a minimalist Christmas or is it over-the-top? We’re scaling back, though it gets harder to drop back to a reasonable level on one gift per person once you start adding spouses and kids in the mix. That’s why my brothers and I have just said we’ll skip each other this year and just go with funny cards. That’s a great point! If you have a large family, one gift/person might not be scaling it back much at all. In that case, maybe you could do one gift/couple for adults and one gift/person for kids or those who aren’t married? In my extended family we’ve just done a gift exchange game and limited the gifts to $10 or so. That’s awesome! How cool that your family was able to discuss it together and come up with a plan! I know this is a huge win for you, Kayla. It’s great that you were able to get your family onboard when I know in the past – they might have been less enthusiastic or confused about cutting back. I love Christmas and giving gifts too. Like you mentioned, these days it is easy to go overboard, which makes gifts become less precious. We try to keep this in mind so that girls truly feel blessed and grateful for the gifts versus expecting them. This is great. 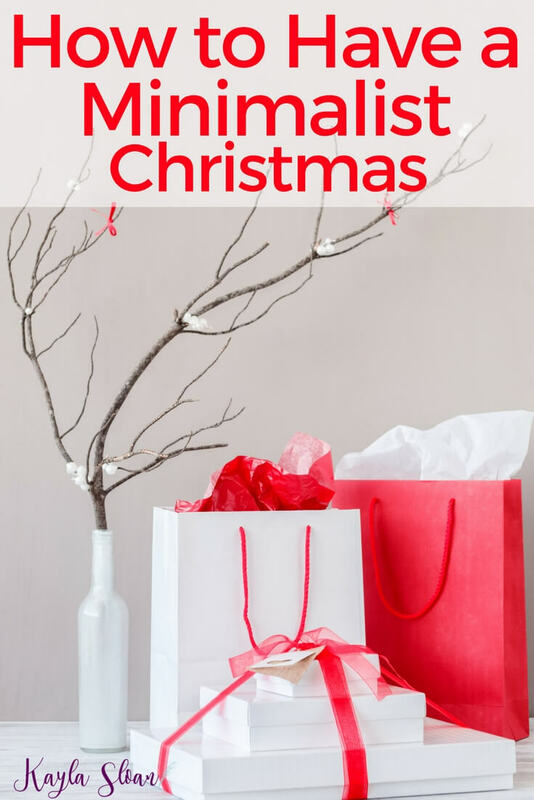 I love the idea of a minimalist Christmas, and am trying to put it to practice with our family, but it is difficult when everyone is at a different stage of their life and there is such a variety of people in our immediate and extended families. Values are all different. I totally get what you mean. I think I was able to put this into practice with my family’s blessing pretty easily because there are only 4 of us that have to agree to this practice. If it were with my extended family it would be harder. I love this! Christmas spending (and gift-giving) can get out of control SO FAST, haha. Like you, I love giving gifts so it can be hard to reign myself in sometimes. This year, my main struggle has been the number of people I need to buy for, not necessarily the price tag. I’m spending Christmas with my in-laws who have a huge extended family and am then seeing my own immediate family right after the new year. Even though I’ve aimed to spend about $10-$20 per person, it adds up! I totally agree! I had a big list for gift-giving full of friends and extended family beyond just my immediate family. I had to trim it down a bit and I’m probably going to have to get kind of creative in order to keep my spending down. I’m a huge Christmas fan too. And I’m with you 100% – I love finding the perfect gift for loved ones. It’s something I actually pride myself on being able to do and always want the gift to have meaning. As a family, we’ve cut back too, because like you said, adults don’t need much. But we still like to give the younger kids a few presents because it is so much fun to watch them tear into presents. Last year I gave my parents and grandparents a homemade gift that they seemed to enjoy a lot more than the expensive presents I gave t hem in the past. I’m not sure what to make this year to top it! I love having gifts with meaning and trying to find the “perfect gift” is something I enjoy quite a bit. 🙂 I hope you come up with something great! This is an interesting question. My husband and I buy gifts for each other and our 7th grade son and our parents but that’s it. We have a small family and we told his two sisters when we got married that we didn’t want to exchange gifts. We don’t go crazy with gifts but because we don’t use credit cards and pay cash for everything, I have this feeling of being virtuous. So I’ m sure we’re probably spending more than we really need to. But, I read the Life-Changing Magic of Tidying Up over the summer and that has shifted my perspective, and my buying habits, quite a bit. It sounds like you guys already have a pretty minimalist attitude when it comes to buying gifts. This year I’m excited to see how much less wrapping paper we waste, how much less time we use unwrapping gifts, and how much more happy (I think) we’ll be with the way our Christmas works out. This will be our last Christmas in England (YAY!) and this year we have decided to do absolutely ZERO gifts! We have attempted to establish no gift policies with our families. However neither of our parents listen. We typically get a care package type of gift with our favorite American Christmas candy and what not. When we do live state side. We typically draw names or couples and then the 4 grandchildren get a gift from each couple on my in-laws side (usually a $20-$25 limit). We usually get something a little more expensive for my husband’s parents by having everybody chip in on the gift. On my side we also typically draw couples names and then each get a gift for my mo m and dad. My parents are the ones who still continue to go overboard. My mom is definitely a gift giver and I’m not sure if we could ever convince her otherwise lol. It’s strange that there aren’t more people who see how great having a minimalist Christmas can be. Getting only one present from each family member doesn’t seem bad at all. I’ve noticed that most people tend to give multiple gifts to one person, hoping that at least one of them will hit the target. A minimalist Christmas makes each family member put a lot more though in every present. Also, I think that people would rather spend less time shopping and have more fun with their families. That is exactly the reason my family approaches Christmas in just this way-more thought goes into that one gift. We spend more of our time having fun and playing family games while spending less time opening packages. It makes Christmas so much more relaxed and fun too!